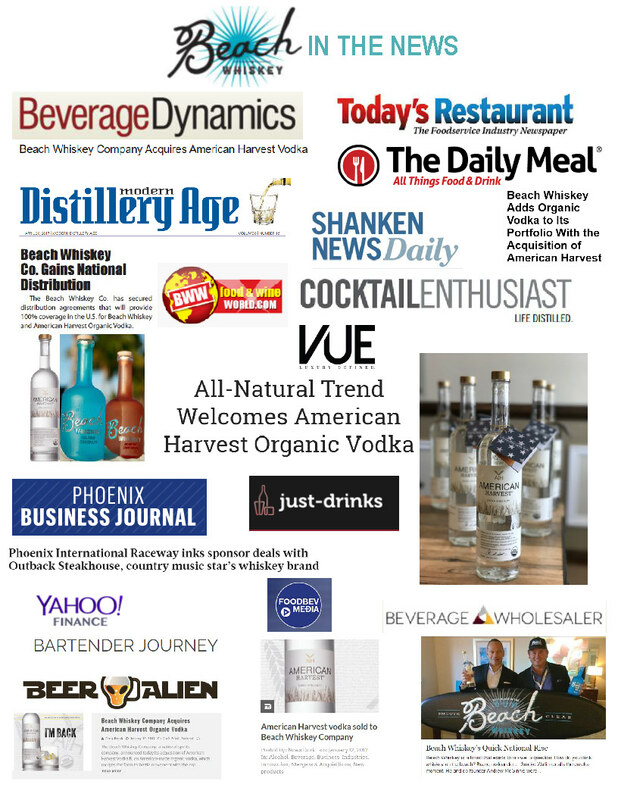 I’m pleased to share our acquisition of American Harvest Organic Vodka from the Frank family. 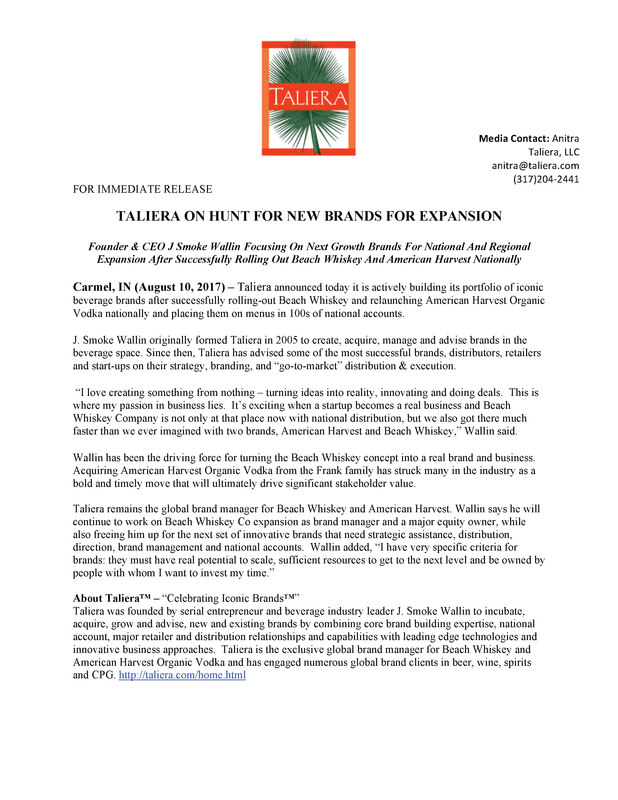 This is an incredible brand and we could not be more excited to add it to our Beach Whiskey Company portfolio. Our Beach Whiskey™ is taking off and we have had the most incredible reception from the trade including some of the most important national accounts in the industry. This is driving us to move faster and rollout nationally early. The addition of American Harvest fits perfectly with this effort as it was national and in most of the key national accounts under Sidney Frank Importing Company. We believe the new branding (packaging) fits perfectly the farm to glass, sustainable nature of American Harvest. While the old packaging was unique, this new look, with American glass and recycled paper label, disclosing the source of all ingredients is on message. I hope you all like it. The Beach Whiskey Company, a national spirits company, announced today its acquisition of American Harvest Vodka®, an American-made organic vodka, which merges the farm-to-bottle movement with the exploding craft spirits category. American Harvest Vodka was created by the Sidney Frank Importing Company (SFIC) in 2011 and gained a strong national foothold by 2014. When SFIC was acquired by Jägermeister of Germany in 2015, the Frank family retained ownership of the brand. 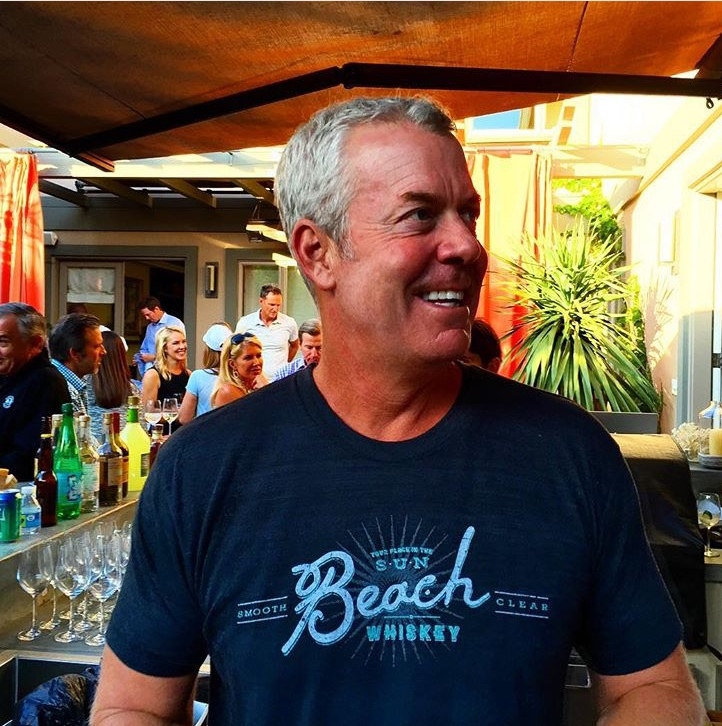 The sale of American Harvest to the Beach Whiskey Company returns the brand to one of its creators, Bill Henderson, now Chief Marketing Officer of Beach Whiskey. Terms of the deal were not disclosed. American Harvest is handcrafted in small batches from American wheat and distilled with 100 percent certified organic ingredients to yield a distinctly smooth spirit with a crisp, clean and slightly sweet hint of real agave. The wheat is estate grown from a single family farm, and the water is from a protected source beneath the Snake River Water basin. 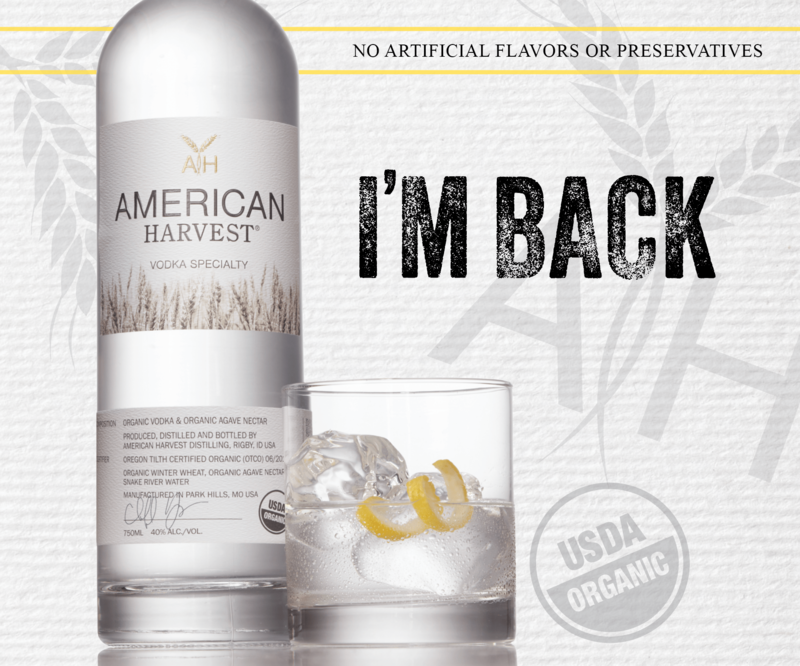 American Harvest Vodka (40% ABV) will be returning to shelves across the country and is expected to regain its national footprint in 2017. SRP: $24.99/750ml. 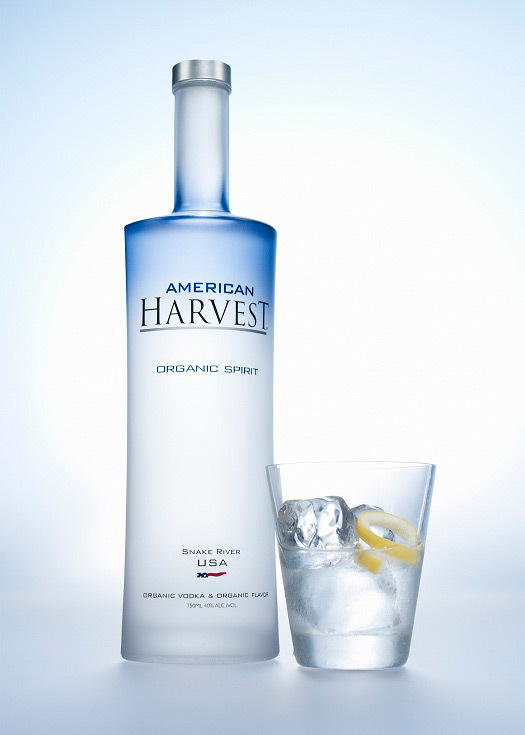 American Harvest Organic Vodka Full Video Story from J. Smoke Wallin on Vimeo. 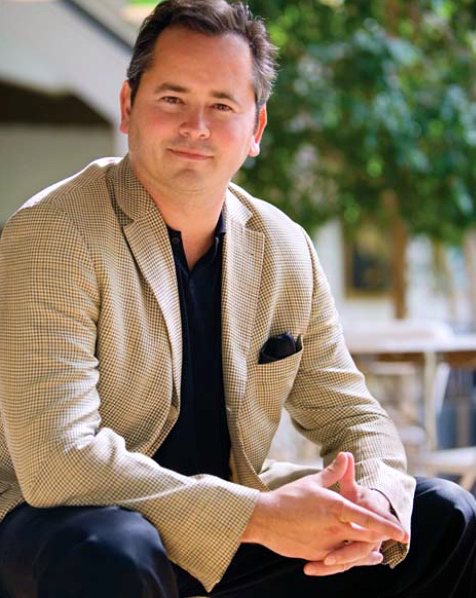 The Beach Whiskey Company is a disruptive brand innovator in the adult beverage space that is building a portfolio of rapidly growing national brands. The Beach Whiskey portfolio includes Beach Whiskey Bonfire Cinnamon™, Beach Whiskey Island Coconut™ and American Harvest Organic Vodka®. Beach Whiskey™ is a reimagined take on traditional whiskey. A line of smooth, clear, naturally flavored American whiskies made for sun worshiping, moon chasing, fun seekers, Beach Whiskey offers day-drinkable flavor profiles presented in sea glass-inspired bottles. No matter where you are, our mission is to bring the beach—”your place in the sun” —to thirsty, fun-loving whiskey drinkers everywhere. Please sip and swim responsibly! American Harvest Organic Vodka® is proudly handcrafted in small batches from organic American wheat, certified organic ingredients and Snake River water. Los Angeles, CA (August 27, 2015) … The Ultimate Beach Party has begun! Beach Whiskey™, a meticulously crafted super-premium American whiskey is set to launch this fall. Beach Whiskey (SRP $27.99, 750ml) is carefully crafted in the United States from corn at partner distilleries to produce a clean and crisp base, before filtering and blending to exact specifications. The team at Beach Whiskey spent much of the past year tasting whiskeys and flavors and testing those profiles with consumers and trade experts to perfect the recipes and final product. At launch, the Beach Whiskey portfolio includes Original (40% ABV / 80 proof), Bonfire Cinnamon™ (35% ABV / 70 proof), and Island Coconut™ (26% ABV / 52 proof). Beach Whiskey celebrates the beach life and all that comes with it… parties, sports, relaxing, good music, and having fun. Even the packaging – an etched label on an embossed sea glass bottle – is designed to evoke the spirit of the beach life and it’s a love of the beach that brought the Beach Whiskey creators together. 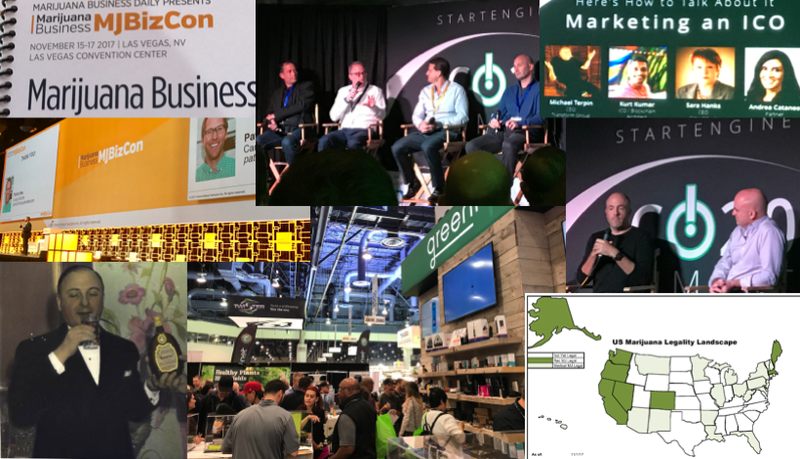 In addition to Wallin, founding investors of Beach Whiskey include TV and radio personality Billy Bush, and entrepreneurs Andrew McGinnis and Kenny Dichter. Beach Whiskey will be initially available in Southern California and Florida, with a selective rollout planned in major markets during early 2016. Beach Whiskey was founded in 2015 by entrepreneurs who are leaders in the beverage, entertainment, lifestyle and business services industries. Beach Whiskey is an American whiskey made for sun worshiping, moon chasing, fun seekers. A whiskey for the wise and the whimsical. A whiskey for those drawn to the water, the waves, who welcome a little wickedness. Beach Whiskey is about time…… your time, our time, our whiskey! Born on the beach, enjoyed everywhere. No matter where you are, our mission is to bring the beach – “your place in the sun” – to thirsty, fun-loving whiskey drinkers everywhere. Please sip and swim responsibly! 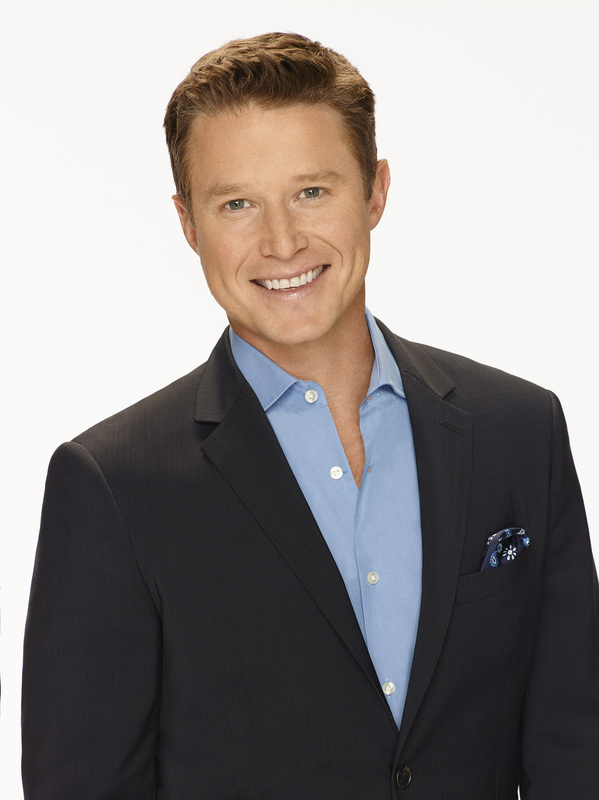 Media samples and hi-res images are available upon request. Contact Laura Peet, PeetCom, Inc., lbptalk@aol.com, (917) 860-6285.